Tyre Maintenance, Balancing your wheels helps prevent uneven tyre wear and minimizes wheel vibration. Balancing is performed anytime you put new tyres on your car and should be performed every 6,000 miles or as recommended by your vehicle manufacturer. An unbalanced tyre can cause premature wear of the tyre, strut and shock, wheel vibration, poor handling, and excessive noise. Unbalanced tyres also cause reduced mileage expectancy. Have your tyres balance checked at your any of our locations throughout Dublin if you notice any of these symptoms. A wheel balance consists of small weights placed around the wheel to help balance the tyre and wheel assembly, ensuring a smooth and comfortable ride. Rotating the position of each tyre helps equalize tread wear, helping to maximize the life of your tyres. Front tyres tend to wear faster than rear tyres on front wheel drive vehicles due to added pressure/resistance from steering. If your tyres aren’t rotated regularly, they may need to be replaced prematurely. Rotating the position of each tyre helps equalize tread wear to help maximize the life of your tyres. 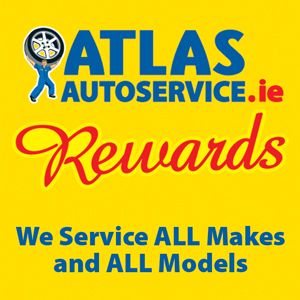 Plan to have your tyres rotated every 6,000 miles, this service is free at Atlas Autoservice after purchasing tyres. Properly repairing a tyre that has deflated or is losing air or has picked up a nail, screw or sharp object is critical. Some tyres may be repaired if they continually loose air or have a puncture in the tread area. Whenever you have a tyre issue, be sure to have it inspected to determine whether it can be repaired or needs to be replaced. 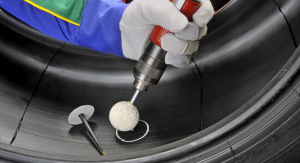 Tyre repairs need to be performed correctly in accordance with strict industry standards. Before any repair, a service professional must properly inspect the tyre by removing it from the wheel and inspect the outside and inside to determine the extent of the damage and to determine if the tyre can be repaired. When a tyre can be repaired, your local Auto Autoservice branch performs a complete repair by using a tyre repair patch. Once completed, the technicians will re-balance the tyre and rim assembly and reset the tyre pressure monitoring system (TPMS), if applicable. 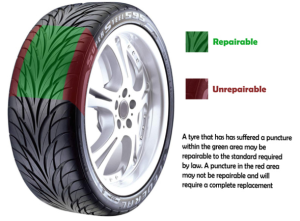 Correct Tyre Maintenance will help the lifetime of your tyres. Drop in today for a free tyre maintenance check or simply request a time that suits you here.